For me personally, it challenged several issues I was facing. Travelling abroad for the second time in two months; leaving a highly fluid work situation going through a complicated patch; being very much connected to the current state of violence in France where my daughter is currently residing. And then of course, returning to Cape Town, the city of my youth, a highly exciting and emotional experience for me at the best of times. I decided to go alone this time and reconnect to the place where it all happened, all that time ago and which set me on the road to my career. It was amazing being picked up at the airport by a driver who held my name on one of those boards that`s usually meant for important people. "Must be for all the celebs returning for the reunion", I said to myself. I had booked in at a recommended B&B on the "other" side of the mountain, where the sun shines brightly and the smell of sea-weed rises up to the Main Road and Egyptian geese from the Green Point Park wake you long before you should, with their squawking on the nearby roof. I was amazed how my memory of directions assisted me across the mountain to Groote Schuur. How awesome, driving along Helen Suzman Drive towards the M6. And then, finding Anzio Road and kindly being instructed to park in the back parking lot past the beam. Meeting up with other conscientious first-comers from all over the world, was wonderful. We piled into the Barnard-Fuller reception room, our name tags the most important part of our attire. There were hugs and warm handshakes and a most unique feeling in the air. After subconsciously noting the grey hair, the tanned wrinkles, it was obvious that no-one had changed, not even a tiny bit! Before long, we sat down to a Cape curry meal, no introductions needed and found ourselves talking nostalgically about our teachers, their idiosyncrasies, their strengths and weaknesses; about how we felt as students in an overly strict system where true student-teacher exchange was discouraged and where several of us felt threatened and intimidated by the attitude of our lecturers and the system in general. After all, most of us were in our early twenties. I was happy to share the story of how I`d remembered Len Kahn`s pathology lectures on soft tissue tumors and how he`d told us that Hodgkins was buried in Jaffa, Israel. * Living in Tel Aviv since 1976, I had for years looked for the grave and only just prior to the reunion, discovered it in a small Protestant cemetery behind a private house in an alley off the main road. I`d written to Len Kahn who was very excited hearing how someone had remembered that lesson and the bit of trivia he`d mentioned. During the entire three days, I was impressed by the good feeling that suffused the occasion. Everyone was so friendly, open and genuinely interested in hearing others` stories of what colleagues had been doing, how their families had developed, of personal successes and even health issues and of course the personal hardships along the way. We even learnt, thanks to Shake Seigel`s ice - breaker at the beginning of the academic session, when "all those with metal parts in their bodies" were asked to congregate in one side of the room just how many outstanding sportsmen had paid the price of joint replacements! The academic program was attended by most of the participants, 65 in all, some partners as well and out of about 150 graduates, this was quite impressive. It was fascinating hearing the presentations of Julian Fuller who addressed the issue of side-effects of medications. He used the example of Droperidol, an anti-emetic drug used freely against nausea, which came into disrepute in the early 2000`s and was effectively black-boxed by the FDA for severe cardiac side-effects. Julian cleverly wove the academic side of this talk into the adventures of his sailing expeditions all over the world. Charlie Johnson gave an excellent analysis on the pros and cons of the capitalist system and the price of drugs, while Rob Murray got us interested in Melrose in Scotland where Sevens Rugby was first played. He carried on the topic later that evening when he climbed Jamie steps dressed in a kilt! Peter Berlyn surprised us all by starting his talk on prolonged QT by throwing grape-fruit into the audience and then passing over gift packs of goodies identically covered in plastic wrapping to all of the class. His gimmick was carefully put together to illustrate the various triggers of the ECG problem and believe it or not, I think we`ll remember the lesson till the next reunion at the very least! The effort invested by Pete in his presentation was quite amazing and most touching to us all. It was clearly a wonderfully giving act of connecting to each and every one of us in the hall in a most generous and creative way and I, personally came away from the talk with a warm feeling of goodwill and caring. The three lady speakers were outstanding! Zuleiga Jaffer started off by wishing us “peace” and reminded us of the Faculty Mission from 2003 which called for social responsiveness and the promotion of health equity, amongst other things. She said it almost needed dusting off as it had been ignored for a number of years. She went on and narrated her family story, the political connotations of her upbringing and described the need for much work to rectify the unjust system that still prevails at UCT. Joan Louwrens quoted Nelson Mandela: " There is no passion to be found settling for a life that is less than the one you are capable of living." She then went on to relate endless doctor adventures, proper ones, from riding on a bike through Africa treating depressed co- travelers, to attending to the ill in the Kruger Park! Marj Dawson (Jobson) blew us all away when she told us about her pioneering work in abolishing the death penalty in South Africa and about her role in trying to create a new post- apartheid South Africa in the work she does for the Khulumani Support Group which supports social justice, full equality, a fair economy and equitable statehood. By this time, we were completely won over and impressively focused when Pieter Bothma revealed the dangers of under - diagnosed cerebral embolism working in the UK where he runs a hyperbaric unit and Marek Rozwadowski showed us how very easy it has been for him working across four continents and changing direction in career choices as he did so notwithstanding the large family he`s accumulated in the process! 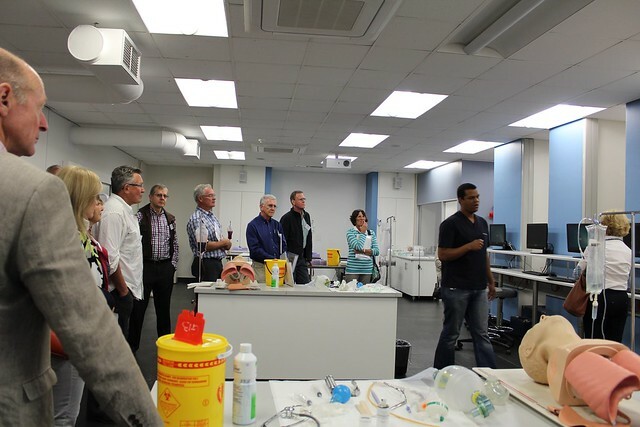 The program was embellished by Clive Gie`s double Power- Point presentation in which he not only demonstrated a laparoscopic hysterectomy, but also described the process on a separate screen. Last but not least, Roger Stewart shared some medical history with us when he told us about Henry Lichtenstein`s discovery of amoebic dysentery on Cape Town`s Rondebosch Common. Most fascinating! It was surely befitting of colleagues sitting in a hall in 2015 that at least one lecture be given to us "virtually", using a video. We swelled with pride hearing about Dave Helfet`s success in New York where he practices orthopaedic surgery and received a lifetime achievement award. The film focused on his patients` praise of his work and reminded some of us of the concept of how the doctor can act as the drug! Listening to his video reminded me how many colleagues were absent from the gathering for whatever reasons. I wondered about all the others who had attended those endless lectures with us, gone through the six year course and what they were doing with themselves these days; how they had developed, what were their stories, successes and challenges? We learnt that eleven class-mates had passed away since our studies. The names printed at the back of the reunion booklet stared at me from the white page. So many unanswered questions needing serious attention, I thought. What had happened to them? How and why and how come? We had no idea…. Back to the program - we were warmly shown around some terrific projects in the Groote Schuur hospital and I was particularly impressed with the enthusiasm of the professionals who demonstrated them to us, be it the advanced MRI machine housed in its magical cave or the learning centre in the simulation laboratory where a plastic model actually spoke and coughed! Professor Gregory Hussey, the interim dean of the Medical School, kept us riveted by his down- to- earth description of the events of the past few months at the university where the students protested and sought change regarding fees and terms of employment of the workers in the institution. I refer you to an interesting summary of the faculty of health sciences of UCT written by Prof Hussey that I came across. Also, proudly, I read that two of our very own graduates are the heads of departments: Asgar Ali Kalla, head of rheumatology and Dinky Levitt Head of endocrinology and diabetes!! The gala event was very special since it was held in the auspicious Smuts Hall built in 1928 with its high ceiling with Smuts` photo on the wall in black and white, overseeing the entire affair of two tables, set one opposite the other. Michael Hayden had the privilege of addressing us at the gathering. He related the Masipumelele adolescent centre that the class and other generous donations from Canada had established through a sense of "giving back" to the place where it had all started for us. Fezeka, a young accomplished lady from the area, touchingly told us how the centre had influenced an entire generation of adolescents who had learnt how HIV spread through unprotected sexual practices. She shared her gratitude with us all. The last day at the Hillcrest Wine Estate in Durbanville was special for me personally. It took me back to the Tygerberg where I grew up and where my father had practised medicine, working as a general practitioner for close on thirty-five years. I preceded the class to the estate where I met a friend from primary school days whom I hadn`t seen for 51 years! Soon, class members joined us and the last few hours of the reunion spent together were special, talking, wining and dining overlooking the green vineyards of the area. Time to leave, saying goodbyes and return to our homes, was indeed difficult this time; I had the sense that this had been remarkable time for us all, that the maturity of our years had afforded a special sort of connecting, of getting closer. There were those who spoke about retiring; there were those who felt it was still prime time; for all of us, three wonderful days to remember and touch base. We gingerly discussed when to hold the next reunion. Would it be ten years, or possibly five? The decision is still pending. I shall end with a poem written by Shake Seigel and read by him to all of us, seated in a circle, marveling at his wonderful presence, joie de vivre and confidence that set the tone for a remarkable reunion of the class of 1975, one that will be remembered for a long time to come. Yet our teaching enshrined humanity. We all went our different ways. Taking with us a bit of African lore. Held within our chosen profession. Because in UBUNTU we are all one. Special thanks to our dedicated local organizers, Joan Louwrens, Maureen Stein and Bitty Muller in the UK, without whose persistence, perseverance and fabulous spirit, the event could not have taken place. Almost a post script: We would love to be in touch with others in our class who didn`t make it to Cape Town – hear your stories and where you are.